Robotic surgery is similar in some ways to a video game. To play a video game, the control button is moved left or right, up or down, and the machine translates the movements into real-time, mimicking the moves precisely on the screen. During a robotic-assisted procedure, the surgeon uses a master control to manipulate the instruments, and the instruments translate the movements of the surgeon into precise movements inside the body. The surgeon is in control the entire time as the surgical system responds to the direction provided. During robotic surgery, the surgeon makes tiny incisions and inserts miniaturized instruments, and a high-definition three-dimensional camera. Often times, skin incisions are not required at all. From a nearby console, the surgeon manipulates those instruments to perform the necessary operation. Surgeons who use the robotic system find that for many procedures it enhances precision, flexibility and control during the operation and allows them to better see the site, compared with traditional techniques. Using robotic surgery, surgeons can perform delicate and complex procedures that may have been difficult or impossible with other methods. Now, the use of robotic surgery on eyes is being examined in clinical trials. In 2016, researchers from the University of Oxford’s Nuffield Department of Clinical Neurosciences launched a clinical trail to test the PRECEYES Surgical System. This robot is designed to perform surgery on the retina, the surface at the back of the eyeball. Just as with the da Vinci™ surgical system, the surgeon uses a joystick to control the mobile arm of the PRECEYES system. Doctors are able to attach different instruments to the arm, and because the system is robotic, it doesn’t react to slight tremors that can plague even the most steady-handed surgeon. 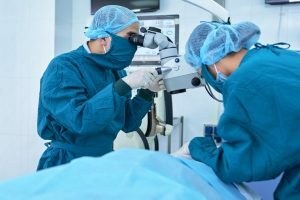 Though doctors are able to perform delicate surgery on patients that have no vision, their hands aren’t reliable enough to pinpoint specific spots on the retina for patients that have some vision. According to the trial leader, Robert MacLaren, PRCISEYES may also allow surgeons to directly unblock blood vessels, or inject treatments directly into a patients’ optic nerves – two operations that are currently impossible. Ensuring that the equipment you are designing delivers the accuracy required is where Universe Optics plays a role. We work side by side with your development team to ensure the precision lens required is perfectly suited for your application. The da Vinci™ surgical system is already widely used, and PRECEYES Surgical System is in clinical trials. The development of these robotic surgeons and the precision that they provide greatly reduces risk factors and open new doors to different types of surgery never before possible.